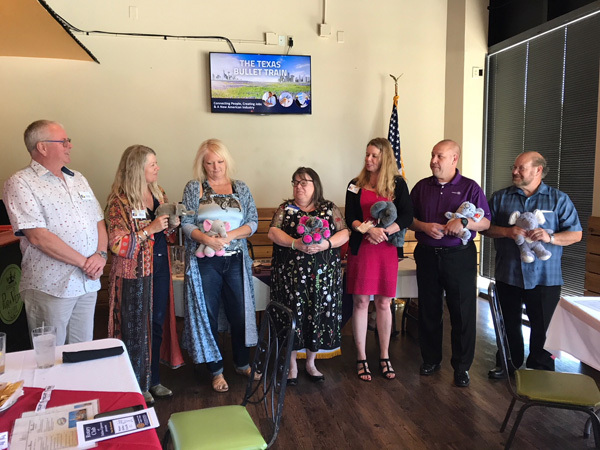 Dallas-Uptown Past President Alicia Slay presents elephants to her fellow past presidents in a tradition adopted from her beloved Texas Aggies. Pictured here are: PE Durane Castleberry, PP Krista Hartman, PP Sissy Littlefield, PP Lori Crider, PP Alicia Slay, PP Randy Watkins, and PP David Helfer. (Not shown: Current Uptown President Teresa Kitchens) Club President is not an easy job. Thank you for all the time and energy you all have put into keeping our club one of the best!